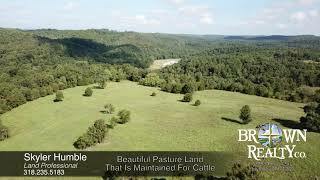 Comments – This beautiful 87 acres consists of rolling pasture and a mix of hardwood timber. It will provide deer, turkey, hogs and bear hunting. The pasture can provide some cattle grazing income. It has a 3 bedroom, 1 & 1/2 bath home with an additional room that could be used as a fourth bedroom or office. It is priced to sell! Check it out.